How many times have you watch a bar band cover The Beatles? How many times has that band actually included a Beatle? 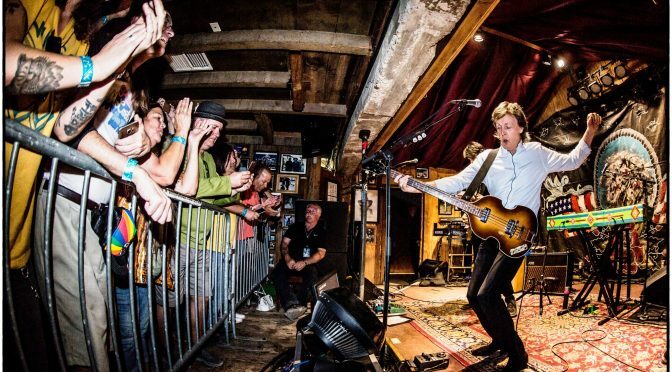 On his way to Desert Trip, AKA Oldchella, Paul McCartney and band stopped off to play a quick set at Pappy and Harriet’s, a high desert bar with a capacity of 300 people. Yes, three HUNDRED people. By the looks of this fan video of the band playing “A Hard Days Night,” I probably would have peed my pants and then exploded had I been there. Photo via Paul McCartney’s Facebook.